So what is an Aadhar card? Well, it is a unique identity card. It is provided by the central government to give you a national but individual identity of your own. It is a pleasant idea to have an own identity too where no one else can breach or forge you as this card is totally biometric and registers your fingerprint and retina scans as its record. After applying for the card, you can get hold of it through your postal address as it will be delivered to you, within a time period of 3 to 4 months. And who may have had their Aadhar card and were unfortunate to lose it. Both the kind of people stated above are not so much in favourable conditions but the process of retrieving the Aadhar card is extremely easy. But again two conditions can arise. Or you do not have them. If you have them then it is definitely very good, but if not again you do not need to worry. 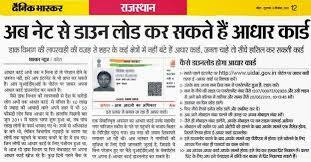 You need to visit the UIDAI site and visit the lost card page. You will be advised to mark the detail you want to know, your Aadhar card number/your enrolment details. Then you need to fill in your name in block letters as it is exactly on the card. Then you have to provide your registered mobile number and then enter the ‘Captcha’ as shown. You have to click the send OTP button. You would get an OTP on your phone and again you have to enter the OTP in the respective box. Once you click the button below, you would get the details you had applied for in your phone. Once you get hands on your details, then you can opt for the option of E-Aadhar, that is electronic Aadhar, which is as good as the original. You can either choose the option of enrolment number where you have to enter the 14 digit enrolment number with the time and date, then your name, then your postal id, and then again the “CAPTCHA” in their respective boxes. In case you have opted for the Aadhar card number option, you only have to enter the 12 digit Aadhar card number and the rest remains the same. Then you have to click the send OTP button, and you would get the OTP on your phone. You have to click the option of ‘Validate and Download’. Once you are done with these processes, the file would get downloaded in your system as a PDF file, which you can open using your postal code as your password. You need to right click on the icon that shows ‘validity unknown’ and then go ahead and click on the ‘Validate signature’ option. A window will open in front of you that is known as the Signature validation status window. You will have an option stating ‘NIC sub-CA for NIC 2011, National Informatics Centre’. This is actually a certification path. You need to mark this certification path. Then you need to mark the tab which states ‘Trust’. After that, you need to click on the ‘add to trusted identities’ option. Then you need to put a tick against the ‘Use this certificate as a trusted root option’. Then you need to double click on the ‘ok’ option. This window will get closed and you need to click the ‘validate signature’ option. These services that the Aadhar card provides also shows that it is meant to stay for a long time. A concept that has come for the betterment and will help India progress a lot. 0 Komentar untuk "How to Download UID Aadhar Card - Online E Aadhar Card"